Attached is a story of the Wellington Pit Disaster 1910 I thought would be ideal for your web site, as it was before the Coal Mines Act that introduced the legislation for the Mines Rescue Service 1911. One of the brigades came from Elswick, Co Durham, were I received my training. I was looking for permission to use it and came across the paragraph below. So if you wish to use it it seems ok. This web site has been designed and written by the volunteers and staff of Haig Colliery Mining Museum. Schools and individuals are welcome to download the site as required for non-profit purposes. The first indication something was wrong reached the shaft top about 8 o'clock Wednesday night. An exploration party was despatched down the shaft and news quickly spread around the town. A large party of police were almost immediately on the spot but there was no difficulty in preserving order. The great crowds, which by now, numbered in their thousands, stood quietly on the clear, starlit night. Rumours spread of an explosion which had blocked the main road. Hour after hour the crowd stood, the only movement was to allow the passage of employees. As the night wore on, and the faint light of dawn appeared, there was still no news and the worst began to be feared. An entire shift of men, numbering 143, had entered the mine the previous evening. Only six had managed to escape immediately after the explosion, leaving 137 men still unaccounted for. Constant supply of bricks, lime, brattice cloth, fire extinguishers, planking, etc, were being prepared to be sent down the shaft and during the morning, news spread that the rescue attempts were going well. A rescue party that were relieved at 1.00 o'clock in the afternoon reported things were improving and good progress was being made. The work had centred on re-connecting the haulage rope, which had been parted in the explosion, and working forward with brattice cloth to fight the fumes, which seemed to be coming from a fire. Mr J.B. Atkinson, HM Chief Inspector of Mines for the Northern District, arrived by 4.00 o'clock in the afternoon, accompanied by Mr H.A. Abbott, Inspector of Mines for the North-Eastern District and were briefed on the situation. They both then descended the shaft to inspect the progress that had been made. The fire by now had taken hold at the friction gear. Just below this point, the roads head off to No.3, No.4, No.5 and No.6 workings. There had been men at work in all these districts except No.4. before the explosion. The rescue parties were now fighting there way towards these junctions but were battling forward five yards only to be pushed back ten. The brattice cloths were, at this time, too hot to touch. With the risk to the rescue teams and the possibility of a further explosion, Mr Atkinson ordered the mine be cleared of all men. He stated it would be impossible for anyone to be alive on the other side of the fire and ordered every man to proceed to the surface. Some of the rescue party, concerned for trapped men, needed to be forcibly dragged away. 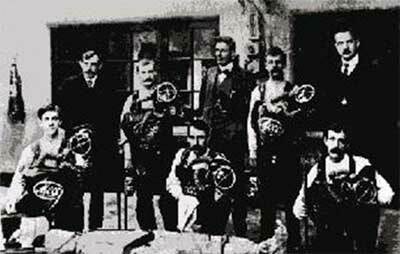 A conference was held at the pit top at 9 o'clock that night (Thursday) between the Inspectors and Colliery Officials. 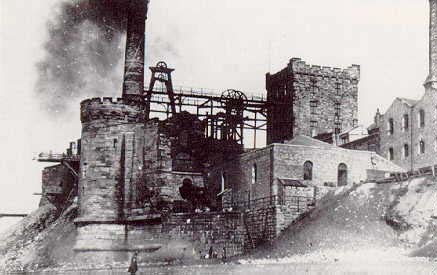 It was decided to wait until special rescue teams arrived from Armstrong Whitworth and Co at Elswick, and The Sheffield Mining Company. The teams arrived about 11 o'clock and proceeded to enter the shaft with their special breathing apparatus. The Sheffield men, Mssrs Thorn and Littlewood, were well known in mining circles as the two most experienced men available. They carried "Wegg" and "Meco" breathing sets whereas the Whitworth men, Mssrs Robinson and Wishart, carried "Aerolith" and "Dræger" sets. The Wegg sets had air purifying chambers worn strapped on front and back, while the helmet, which resembles a divers helmet, has an appliance on one side holding seven small tablets, each sufficient to generate enough oxygen to keep a man alive for one hour in the deadliest gas. The party descended the shaft at 11.25, accompanied by the Inspectors, colliery officials and a party of the best miners that they could find. On reaching the bottom, they walked for just under three miles before stopping to set their equipment. Mssrs Thorn and Littlewood then set off on their own in an attempt to pass the fire and get into the workings beyond, to check the air there. After battling ahead for 170 yards, the smoke was so thick, they could not see their torches. Thorn, who led, with Littlewood a few steps behind, tripped over some fallen telegraph wires which were so hot they badly burned his legs. On reaching the brattice cloth, Thorn put his hand around the side and described it "like putting your hand inside an oven". They could hear the crackling of the fire but could see nothing for the smoke. The heat was so intense that the soldered name plates on the helmets were melted and caused a blister on each of the men's faces. Reluctantly, they decided to turn back after twenty minutes, no longer able to stand the heat and fearing for another explosion.